It's easier than ever for small businesses to have a website. A website can provide all kinds of benefits to a business. It can verify the existence of a business, increase visibility to new and current customers, and improve customer experiences. But, how many small businesses take advantage of these benefits? 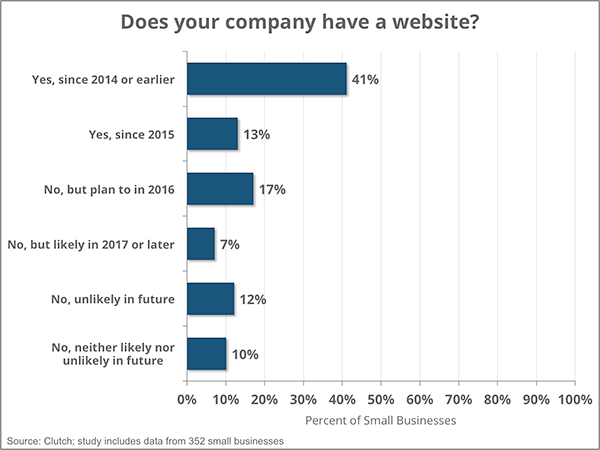 Nearly half of small businesses do not have a website, according to our second annual small business marketing survey of over 350 small business owners and managers. The majority claim that they do not have a website because it is not relevant to their business or because it's too expensive. Moreover, for those that do have websites, 23 percent are not mobile friendly, and another 9 percent have unknown mobile capabilities. Luckily, these businesses are planning improvements to their sites, especially in areas of search engine optimization, social engagement, design, and content. 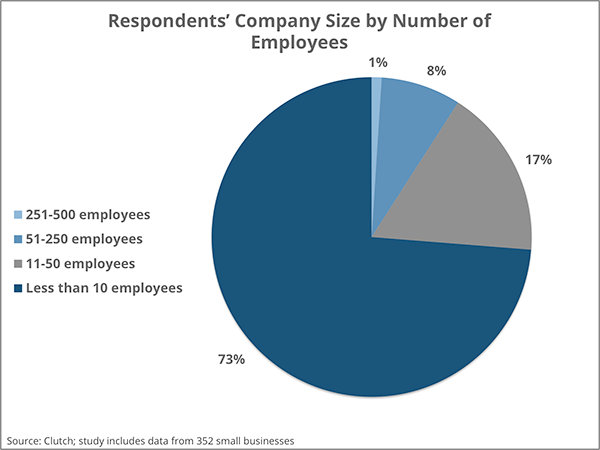 * The majority of survey respondents are businesses with 1-10 employees and less than $1 million in annual revenue, a true representation of small businesses according to the US Census Bureau. To begin, we asked the small businesses if they have a website. Overall, 54 percent currently have a website and 46 percent do not have a website. 24 percent plan to build a website in the near future. 12 percent are unlikely to build a website in the future. 10 percent are unsure whether they will build a website in the future. These results raise many questions. Most blatantly, why do nearly half of small businesses not have a website? Joe Ardeeser, owner of Jordan Crown Web Design, positions the lack of small business websites as a feasible dilemma. While the shortage of small businesses with websites is understandable considering the level of commitment required, agency leaders were surprised to find that nearly half of those surveyed still do not have a website. A website can help verify a business’s existence, increase credibility, and relay accurate information. Additionally, a website can help bring in new customers that are searching online. 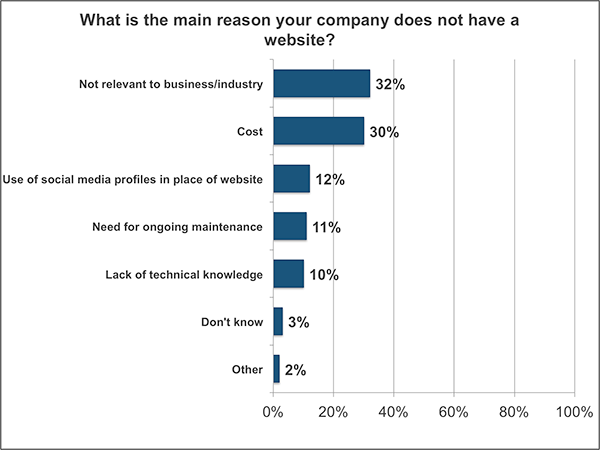 So again, why do nearly half of the small businesses surveyed not have a website? Other reasons included the use of social media profiles as an online presence instead of a website, the need for ongoing maintenance, and a lack of technical knowledge. Of the small businesses without a websites, 32 percent report that having a website is not relevant to their business or industry. However, agency leaders unanimously conclude that a website is relevant to every business and every industry, in some capacity. In some way or another, a website is relevant to all types of businesses in every industry. What varies by industry or business type is the website design itself, including the type of website and its features. While the capabilities of the website can depend on the business or industry, the bottom line is that some sort of website will benefit every type of small business. The cost of a website can vary dramatically. One option is to hire a specialty web design firm to build a quality, custom website specifically for a small business. While this type of site surely will be high quality and customized, not all small businesses need a website of this caliber and cost. However, with lower cost DIY website platforms, building a brochure or informational website becomes a more simple and cost effective solution. Nowadays, there are various options to build a website, resulting in an ideal cost structure for every business. With several options for building less expensive and less time-intensive websites, is the cost of a website still a viable reason for small businesses not to have a website? Or, are these small businesses really dealing with the cost of NOT having a website? Instead of viewing a website as too costly or unnecessary, a small business should see a website as an investment for their business. Once built, a website can have an incredible return on investment (ROI), especially in the long term. While these small businesses have practical reasons for not investing in a website, these reasons are trumped by the practicality and benefits of having a website. A website is not only useful for capturing new customers, it is also necessary for credibility, visibility and meeting current clients needs. For the small businesses that do have a website, we investigated the mobile versatility of the site and further questioned 2016 plans for site improvements. A mobile-friendly website is especially important, considering recent increases in the amount of customers that visit a website from a mobile device. As the amount of people dependent on smartphones for Internet access continues to increase, having a mobile-friendly website will become a requirement. In fact, not having a mobile-friendly website can hurt a business with a substantial amount of mobile users. 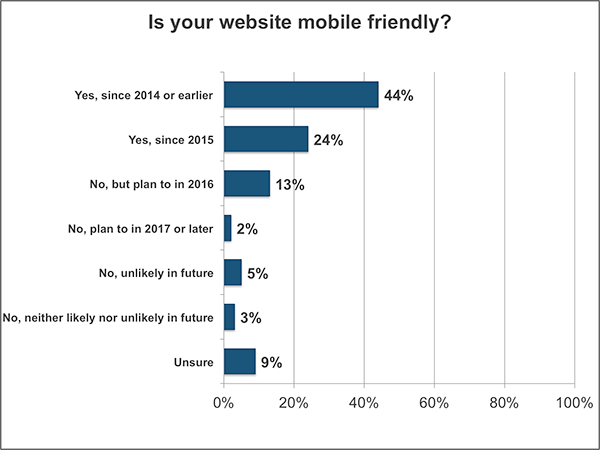 While mobile friendliness has gained ground in the past year, a significant amount of small businesses have not made their websites mobile friendly. Not having a mobile-friendly website can result in decreased usability and a loss of current and potential customers. In addition to losing frustrated mobile customers, not having a mobile-friendly website can also limit search visibility. If losing customers and being penalized by Google isn’t enough, those who do not have a mobile-friendly site will continue to fall behind on mobile website expectations. Those without a mobile-friendly site will continue to encounter a myriad of challenges, both now and in the future. Even those that have a mobile-friendly site face challenges around optimizing their site for an endlessly fluid mobile market. Those that have a mobile-friendly site need to reevaluate the mobile friendliness of the site and frequently optimize it for mobile usage. For small businesses without a mobile-friendly website, now is the time to implement a mobile-friendly strategy that works to optimize the site for mobile, improve mobile usability, and enhance mobile design. Whether it be content development, design iterations, building new features, or improving security, there are always elements of a website to update and improve. 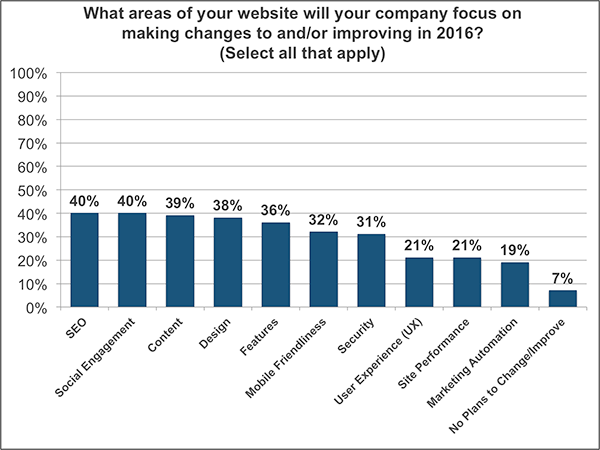 What areas of their websites are small businesses planning to improve in 2016? Max Elman asserts that small businesses are on the right track with the top intended website improvement areas for 2016. Since SEO, social engagement, content, and design are considered basic elements for the foundation of a website, it makes sense that these are the areas that small businesses plan to focus on the most in 2016. For example, being found online is a necessity, so it is understandable that 40 percent of the small businesses with websites plan to focus on SEO this year. However, Joe Ardeeser explains that while SEO is important, other areas of a website are just as essential. Agency leaders also identified prominent gaps in the website areas small businesses plan to improve. Most notable, they relayed dismay about the lack of focus on user experience and site performance. Only 21 percent of small businesses plan to work on their website's user experience. This is a concerning number considering how important customer loyalty and customer satisfaction is to a small business. Another area of concern is the lack of commitment to improving website performance. 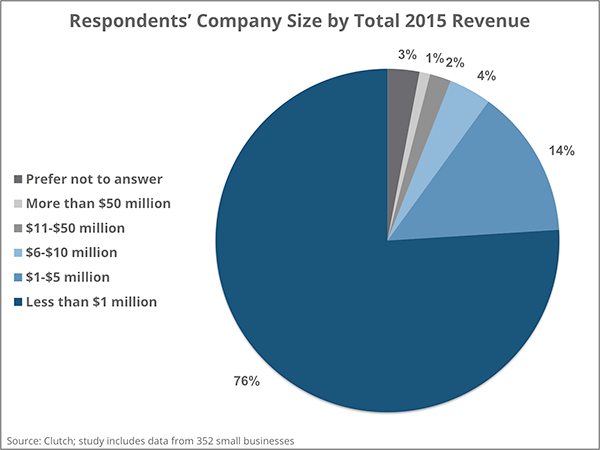 Only 21 percent of small businesses plan to address site performance in 2016. Site performance increasingly requires more attention as other features and functions advance. Each new design, animation, and feature adds a layer to a website’s foundation. Thus, a site will become slower and less cohesive if site performance is not addressed continuously. Overall, 93 percent of small businesses with websites are on the right track, with plans to improve some part of their website in 2016. However, as the agency leaders point out, for small businesses to stay competitive online, they need to maintain a website strategy that includes consistent improvements across the board. For the small businesses with websites, there are always areas to improve to maximize visibility, credibility, and usability. Both usability and site performance should be priorities for small business as they improve their websites in 2016. In conclusion, small businesses that have websites will continue to benefit, and those that have mobile-friendly, user-friendly, and optimized sites will beat out competitors by offering users a higher quality website experience. Clutch collected this survey data from 352 small business owners or managers in the US. The largest respondent group is made up of companies with less than 10 employees and less than $1 million in annual revenue. To request additional information or to provide feedback on this survey, please contact [email protected]. What are Your Options for Building a Website?